Well, MACNA XXI is in the rearview mirror, along with all the traffic on the Atlantic City expressway. This years MACNA was number six for both myself and That Fish Place, and I must give my complements to the New Jersey Reefers Club and MASNA for a very well organized and well run show. What a great bunch of folks, I lost count of how many times someone from the club stopped me to make sure we did not need anything, or just to ask how things were going. I would also like to thank all the attendees that stopped by our booth. It is great to meet people who know us as a mail order company, but never get to meet us, or visit our retail store. Lots of familiar faces as well, we really enjoy the interaction at events such as this. With the venue in Atlantic City this year, we (along with several other vendors) put an element of gambling into our booth with a Plinko game. Wow, was that a popular idea! We even had other vendors coming over to play. We had some great prizes to win in the game, everyone won something, it was a lot of fun. We had some special T-Shirts made up for the show, they were by far the most popular prize in the game, I think that you will see them make an appearance in our store in the near future. One of the things that the New Jersey Reefers did with this particular show was set the workshop demonstrations up in multiple locations within the exhibit hall, a great idea. With the video system they used, it allowed far more people to see the Demos. Especially for the folks who only attended the show for one day, I think that it let them get more done in a short period of time than at past shows. They had three demo areas running at once, for an hour each. Each demo lasted 15 minutes, then repeated, this allowed you to see all three demos within the hour, without having to move from room to room. I sat in on a couple of the demonstrations, one by Justin Credabel (great name, I think I need a new one) and Kelly Jedlicki, both were very interesting, short, and too the point. I will post a follow up blog about the topics that they discussed. The speaker hall was in a nice sized room, a short walk from the exhibit hall, and again very well organized with video systems so that no matter where you were sitting, you had a good view of what was going on with video screens and monitors throughout the hall. Unfortunately, time did not allow me to get away from the exhibit hall to see most of the speakers, but Cory and I did get a chance to see a few. We will also post some blogs about the topics of discussion in the near future. We had a great time at the show, and from what we saw, so did most everyone else. For those of you who have never attended a MACNA show, I would very much encourage you to do so. There is so much to see and do, and everyone is there to have a good time. Hopefully, we will see you in Orlando next year for MACNA XXII. 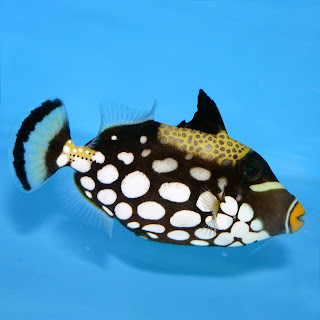 Welcome back Mellisa, I hope that you enjoy this general article about Triggerfish. 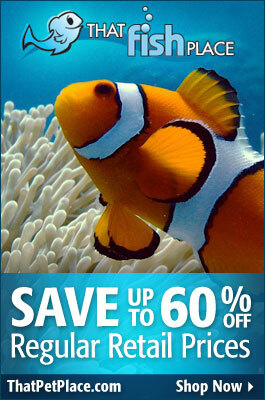 These are facinating, beautiful, and fun fish to keep in your marine aquarium. Triggers are with out a doubt some of the most aggressive saltwater fish available to hobbiest. They are carnivores and will eat any small tank-mates. Triggers usually aren’t very picky when it comes to food. They should be fed shrimp, scallops, krill as well as meaty pellets. Triggers should be housed in a large tank 100 gal or more. Larger wrasses, groupers, eels, and large angels are acceptable tank-mates. Most triggers are not reef safe and will chomp on corals, eat crustaceans, as well redecorate the tank upsetting corals and live rock. Use extreme care when placing heaters and power head cords inside the tank. Triggers tend to be very curious and may nibble on the cord causing harm to themselves as well as other tank mates. An aquarist must use caution when working in the tank to avoid being bitten. In the store we sell several different species of triggers. Some are very aggressive and should be kept alone while others are fairly docile and may be kept in a reef tank with caution. One of my favorite triggers is the Queen trigger (Balistes vetula). What can I say, I love my queens (Queen angels and Queen triggers). Queen triggers are gorgeous but don’t let their attractiveness fool you. They are very aggressive and get very large which may be part of the reason this fish is not seen all that often in the trade. 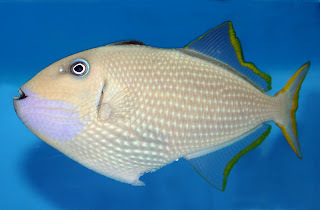 The Fuscus trigger (Pseudobalistes fusco), Clown trigger (Balistoides conspicillum), and Undulated trigger (Balistoides undulatus) are also very aggressive triggers but are commonly seen in the trade. These triggers are very attractive and will add character to any predatory tank, just make sure other tank-mates are established and will be tough enough to hold their own. There are a few triggers that are considered “reef safe” with caution since they are mainly planktivorous. While these “reef safe” triggers do not eat coral, they will most likely eat hermit crabs and shrimp, so be prepared for this behavior if you try them in your reef. Some triggers in this category include Blue Jaw triggers (Xanthichthys auromarginatus), Sargassum triggers (Xanthichthys ringens), Pink Tail triggers (Melichthys vidula) and Niger triggers. These triggers appear to be less aggressive and are commonly seen in the trade. 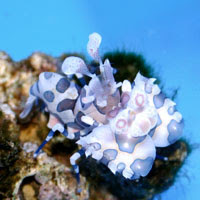 Harlequin Shrimp (Hymenocera picta) are one of the coolest looking shrimp out there. They are a psychedelic whitish pink color splashed with purplish brown spots. They have flattened antennae and paddle shaped claws that appear almost leaf like. Each harlequin shrimp has their own unique pattern almost like a human fingerprint. No two are alike. As with any marine invertebrate, Harlequin Shrimp require pristine water quality to thrive. They prefer a specific gravity of 1.023-1.026 and temperature between 76-78 degrees. They also like a tank with sufficient rubble rock with crevices and caves for them to hang out in during the day. They do better in pairs in a smaller species only tank since they tend to be shy and reclusive. Harlequin Shrimp are considered to be reef safe, however, in reefs that include sea stars they will become lunch…it is just a matter of time! Harlequin shrimp are very unique because they feed exclusively on starfish which makes them rather difficult keep unless you have on hand a constant supply of starfish. In the wild, they dine on tube feet of linkia species sea stars, particularly the comet and blood spotted stars . In captivity it may take a few tries to find the type of starfish your harlequin shrimp prefers. Some acceptable starfish species to try include linkia stars, chocolate chip stars, sand sifting stars, fromia stars, and crown of thorn stars. While they can go a period of time without food they should be fed at least a starfish a month. Brittle stars are the one type of starfish that appear to get off the hook and are not of interest to the harlequin shrimp. That is most likely due to their ability to move fairly quickly and stay out of reach. So if you have a small tank and are willing to splurge for a few starfish every once and a while then a pair of harlequin shrimp just might be the cool little addition you have been looking for. I hope you enjoyed my profile on the harlequin shrimp, until next time. A customer recently asked me a question about using a canister filter on their saltwater aquarium. The customer had read on Reef Central that you should not use a canister filter on a saltwater aquarium, especially on a reef aquarium. That they do not work well, and will cause high nitrates. This is a topic that you will see differing opinions on. The problem with canister filters is not that they don’t work on saltwater or reef aquariums, they work very well. Any biological filter is going to produce nitrate on a closed aquarium system, it is the natural end product of the nitrogen cycle. This is why many reef tank owners will remove the bio balls from their wet dry filters, or run their systems on a sump only set up, in an effort to reduce nitrate production. This is why some people are of the opinion that canister filters should not be used on a reef tank. You can get away with this approach if you have a sufficient amount of live rock and substrate in your aquarium to act as your biological filter. In fact, live rock is an excellent source of nitrifying bacteria, and will function as a very efficient biological filter in an aquarium with enough rock. Most reef set ups will work well without a dedicated biological filter, so long as the biological load is not too high, and you are using a good protein skimmer. This method is often referred to as a “Berlin” style aquarium (lots of live rock, good water movement, heavy protein skimming, and no biological filter). Canister filters can still be used on reef tanks, they can be used as additional biological filters in heavily stocked tanks, and can easily be used for whatever chemical filtration media you may want to use. Saltwater fish only tanks are a different story; in most cases you will need a biological filter to handle the fish waste and biological load, even if your tank has live rock in it. You will also want to have a mechanical filter on a saltwater fish tank, especially if you have large fish in your tank. Most canister filters give you the ability to operate them in different ways. You can use them for biological, mechanical or chemical filtration as needed. Nitrate is going to be produced in any set up, some more than others. My best advice is to use as much filtration as your aquarium demands. Ammonia and Nitrite should be near zero in an established aquarium, if you are detecting either, chances are your aquariums biological filter is insufficient. Nitrate levels will creep up slowly over time in any system, so whatever filtration method you employ, you still need to monitor your water chemistry. Water changes will remove nitrate from your aquarium, so as long as you are testing your water, and performing regular water changes, nitrates should not be a problem.